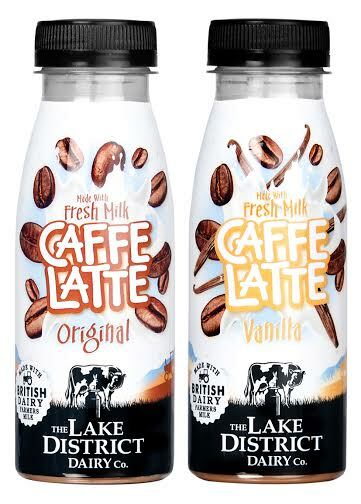 First Milk’s The Lake District Dairy Company, known for its Frumoo and Quark brands has launched a ready to drink coffee called Caffe Latte in original and vanilla variants made using fresh British milk and Arabica coffee. As an alternative to longlife UHT coffee brands known throughout Europe it has superior taste qualities and benefits from a tempting design and graphics. Bottled in off the shelf packaging from injection and blow moulding specialists Esterform Packaging, it uses an 18 gram bottle with 38mm UCS neck and resealable cap, designed for drinking on the go. PET bottles from Esterform offer the ideal choice for fillers of dairy beverages, juice drinks, smoothies and juices (especially fresh pressed). The 38mm necks are offered with 3 start and single start finishes, to match a wide range of closure options. A skilful choice of closure, label or sleeve options can convert a standard bottle into a unique pack. Volumes include 250ml, 330ml, 500ml and 1 litre bottle sizes. Esterform also makes customised 28mm and 38mm neck bottles for coffee syrups, and milk shakes. 1. We drink around 400 billion cups of coffee throughout the world every year. 2. In 1988, British consumers spent more on coffee than tea. 3. Coffee was first drunk in Western Europe in 1683, when the Turkish army left sacks of coffee behind as they retreated from Vienna. 4. Research is being carried out to see if coffee might prevent type 2 diabetes. 5. Some research has shown that coffee can prevent depression. 6. Car-puccino – a car fuelled by used coffee grounds traveled 250 miles from London to Manchester in 2010 – apparently the equivalent of over 10,000 espressos. 7. The most expensive coffee you can buy is said to be Kopi Luak coffee, made from beans eaten and later excreted by the luak ( civet cat) of Indonesia. Imagine collecting those. 8. Japanese researchers have developed a chemical test to check whether coffee has actually passed through a civet cat’s digestive system. 9. Frederick the Great of Prussia drank coffee made with champagne as a calming drink. 10. Coffee may protect women from endometrial cancer. 11. We drink about 1400 million cups of coffee every day. 12. 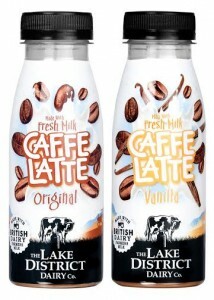 Caffe Latte, from First Milk’s The Lake District Dairy Co packaged in an Esterform bottle is made using fresh milk – a tasty alternative to longlife UHT coffee drinks in Europe.